When posting an Invoice from a Sales Order, a user may get an error like the one listed below. This error is telling you that the Sales and/or COGS accounts for at least one of the products on the order cannot be determined. This article will show some things to look for if you get this error. The first step in troubleshooting this error is to determine how your Sales/COGS Accounts are selected. To do this, open Configuration Manager > Sales Orders and click on Sales/COGS. Take a look at what the ‘Accounts selected by’ is set to. In the screenshot below, the Accounts are selected by the Sales Category (see our GL Account Setup for Sales/COGS article). Based on what the ‘Accounts selected by’ is set to, browse to that place in Configuration Manager. For example, if the Accounts are selected by Sales Category, look in Inventory > Sales Category. 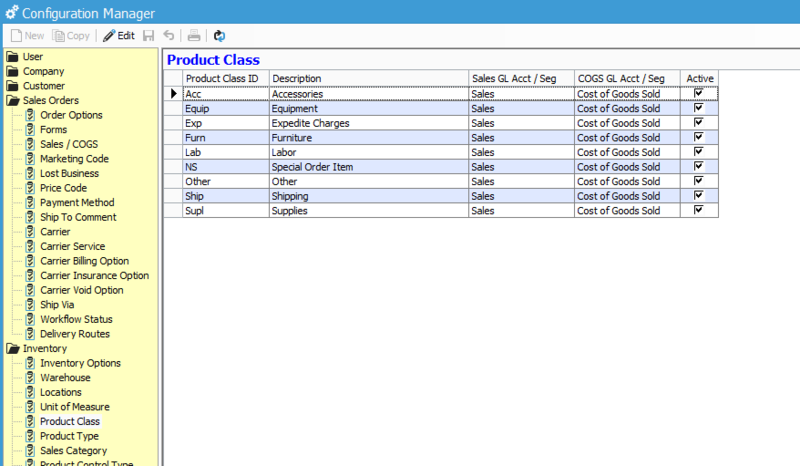 If the Accounts are selected by Product Class, look in Inventory > Product Class. 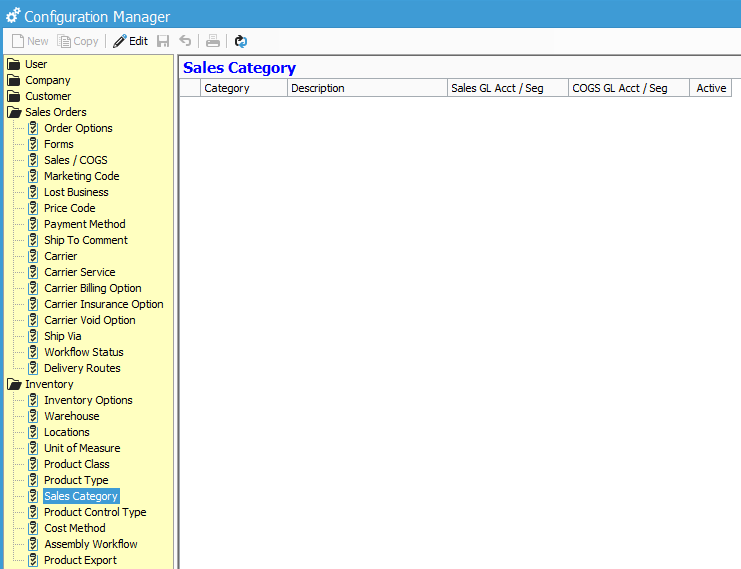 In this next screenshot, we can see the Sales Category section in Configuration Manager. Based on the last screenshot, it looks like no Sales Categories have been set up in Configuration Manager. If this is the case, you would likely see the error in the screenshot below before you see the “Invoice not released” window. In this example, since no Sales Categories are set up in Configuration Manager, it’s likely that the Sales/COGS selection should not be based on Sales Categories. If this is the case, first, try changing the Sales/COGS selection to use Product Class, as that is the most common Sales/COGS selection method. 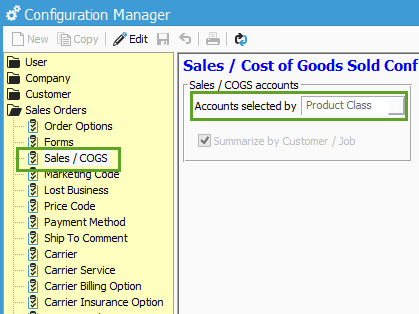 Once the ‘Accounts selected by’ is set to Product Class, look in the Product Class section of Configuration Manager. If values are set in the Sales GL Acct and COGS GL Acct for the different Product Classes, then the Sales/COGS selection should probably be based on the Product Class, and was somehow changed to Sales Category accidentally. In the screenshot below, the Sales GL Acct and COGS GL Acct are all set for the different Product Classes. If Sales/COGS had never been selected based on the Product Class, these Accounts would not be set. To recap, if users are noticing an “Invoice not released. Cannot determine Sales/COGS GL Account.” error when releasing Invoices from Sales Orders, first, check the Sales/COGS Account selection in Configuration Manager. 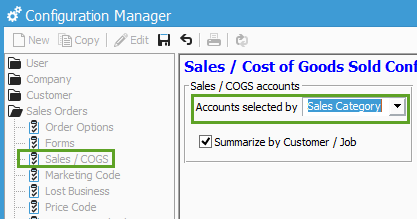 Verify that the ‘Accounts selected by’ option, be it Product Class, Sales Category or something else, has set Sales/COGS Accounts set in their respective section in Configuration Manager. If nothing is set, it’s possible that the ‘Accounts selected by’ option should be based on something else. If you are unable to resolve the issue, contact Support here.